As a girl born and raised in the south, I truly appreciate the value of a monogram. If you aren’t from the south, it might seem hard to understand why southerners enjoy initials on everything. To be honest, I’m not sure if I understand it, either. However, I do know I like it. 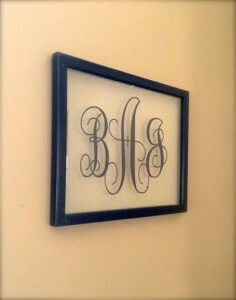 So, I when I came across this adorable idea on Pinterest to put our monogram in a frame, I was in! In case you’re wondering, BAJ is for Bobi Ann & Jared Allen. It wasn’t too hard. I actually ordered the vinyl letters, so I didn’t make them myself. It didn’t cost much to have someone make them. I’d tell you an amount if I could remember, but I made this several months ago. I’ve forgotten. I already had this frame sitting in my garage, but you can buy backless frames at Bed, Bath & Beyond and probably Hobby Lobby. 1. I cleaned the glass. A little vinegar or Windex and the dust and grime from the garage was gone. 2. I measured. I found the center of the glass and the center of my monogram. 3. I marked. I used a dry erase marker (that will easily wipe off of glass) to mark where monogram should go based on my measurements. 4. I carefully peeled the backing off of the vinyl and put it in place. 5. I made sure it was just like I wanted. Then I smoothed down the vinyl onto the glass. 6. I put it in the frame and hung it on the wall. And done! I was one happy, little Texan living in Alabama soaking in all my southern roots! Question: What creative things have you done with your monogram? I could easily get out of hand, but I’m dying to know! My sister-in-law gave us 100 monogrammed disposable cups for a wedding gift (for that party I still need to throw!). They say EWE & ME (“EWE” as in female sheep, pronounced “YOU” and “ME”). Took my husband a while to understand why she didn’t use his middle initial – it would have thrown off the initial pun. But I love that our initials work out to “EWE” and “ME”. Not why I married my husband, but it sure makes me smile! I’ve done shirts, sweatshirts, cups, car decals, laptop monograms, etched mirrors. Now I am thinking about a family tree of letters. Jason, do you do screen print monograms?